Life begins in water. Molecules come together to form the new. Every combination is new and unique, as every moment of water is new and unique. Every being is a new being because of the flow of the water. Water molecules let new and unpredictable possibilities come to life in every second. These series of works question and visualize the uniqueness created in water. A traditional Turkish craft 'Ebrû' —which works with water and allows to experiment with the chemistry between paint and water— is used as the main technique. The moment reflected to water is manifested with the paint that floats on the surface. 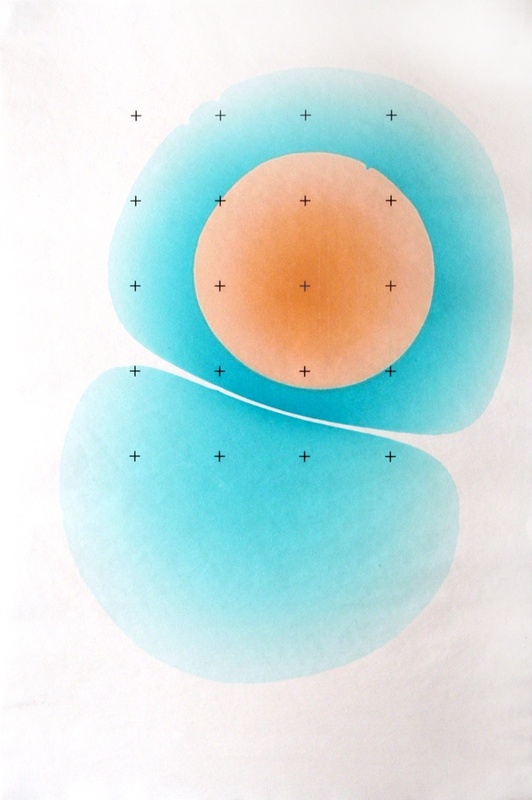 The floating colors pull/push one another, and the results are captured on the paper. Adaptation of a traditional technique to today is combined with the abstraction of the figure. Digital prints (the 0's and 1's) contradict the natural (the H's and O's) while completing and framing the experiment. Born in Ankara, 1979, Tascioglu studied Graphic Design in Anadolu University Faculty of Fine Arts in Eskisehir, Turkey. Continuing her studies in San Diego State University with an exchange scholarship, she started designing and making books. After finishing her Master's Degree with a thesis on book arts and design, she started her PhD in University of Cologne, Germany and finished this study in Institute of Social Sciences in Anadolu University in 2009. She has opened 4 solo exhibitions and been a part of many juried exhibitions. She is currently teaching graphic design, printmaking and book art and design in Anadolu University Faculty of Fine Arts.